In a short video that’s gone viral, Seth holds up yellow note cards asking people to wear yellow — his favorite color — on March 27 to show him some support as he waits for his second bone marrow transplant. 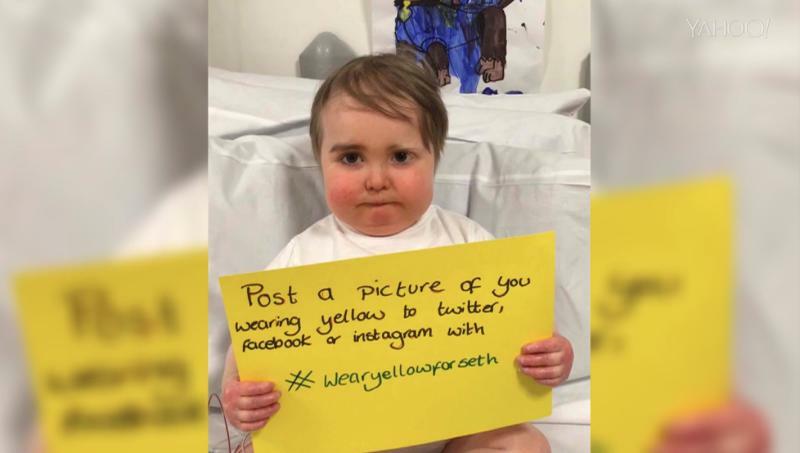 He has asked that people take pictures of themselves decked out in yellow and post them on social media using the hashtag #wearyellowforseth. The pictures will be hung around Seth’s hospital room so he can see that he’s not alone as he waits for and recovers from the procedure. This will be Seth’s second attempt at a bone marrow transplant — the first one failed in 2010 — and he has been waiting in the hospital since January. The procedure, if successful, is supposed to rebuild Seth’s immune system, but he will still have to spend almost a year in near-isolation.